As we near the 150th anniversary of Confederation in 2017, the Government of Canada invites Canadians to experience and learn more about our environment and our heritage. Leave it all behind as you explore this 1827 Hudson’s Bay Company fur trading post. Watch live demonstrations throughout the day and satisfy your curiosity with our audio tour. Stop for coffee or lunch at lelem’ at the fort café. Pan for gold, visit the bunnies and goats, and then rest on a bench while the children build the walls of the playhouse. Daily from July 2nd until September 5th, join in these great activities. 10:30 am – Introductory Tour – Join a short tour providing a synopsis of Fort Langley’s story. 11:00 am – Blacksmith and Cooper – Watch sparks fly as our blacksmith bends steel, then watch as the cooper shapes barrel staves. 12:30 pm – Feature Interpretive Program – Join in the excitement of an interactive presentation highlighting the stories of Fort Langley’s original inhabitants: the boat builders, fur traders, farmers and families. 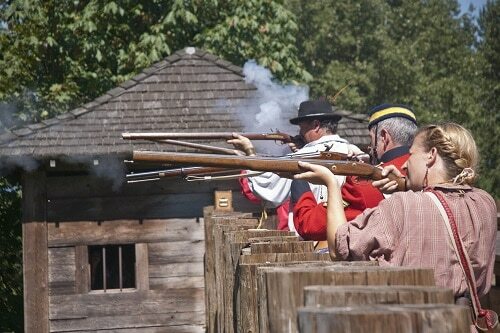 1:00 pm – Introductory Tour – Join a short tour providing a synopsis of Fort Langley’s story. 1:30 pm – Blacksmith and Cooper – Watch sparks fly as our blacksmith bends steel, then watch as the cooper shapes barrel staves. 2:00 pm – Historic Guns – What guns were used during the fur trade, and when were they used? Get all the answers at this demonstration. (Musket firing is weather dependent). 2:30 pm – BB Musket Target Practice – It’s your turn: fire a bb-style musket and take home your souvenir target. Ten shots for $3.90. 3:00 pm – Blacksmith and Cooper – Watch sparks fly as our blacksmith bends steel, then watch as the cooper shapes barrel staves. 3:30 pm – Historic Gun Cleaning – Meet a costumed interpreter while they care for the historic weapons. 4:00 pm – Farm and Garden Walk – Discover the types of plants Fort Langley has growing in the heritage garden and visit the farm animals. Learn about the history of the Hudson’s Bay Company farm. 4:30 – Flag Lowering – Witness the lowering of the flag with a song. Camp Voyageurs runs July 18 – 22 and again August 8 – 12, 2016, and gives youth the opportunity to experience what life was like living as a legendary Voyageur. They will learn skills to survive in the wild, participate in crafts, music and activities related to the French, Metis and First Nations cultures of the fur trade, and enjoy traditional bannock as a tasty treat. Trades Camp runs from July 11 – 15, 2016 and again from August 15 – 19, 2016 and youth will have a hands-on experience with what life was like in a Hudson’s Bay Company fort in the 1800s. They will dress up as a Royal Engineer, fire an airsoft musket, learn how blacksmiths make tools, take part in making a barrel, and pan for gold. Developing new and innovative programs and services allows more Canadians, including youth and newcomers, to experience the outdoors and learn about our environment and history. Parents can register their children today online: http://www.pc.gc.ca/eng/lhn-nhs/bc/langley/activ/activ17.aspx. The camps are open to ages: 6 – 12 and cost $166 per child/per week or $146.50 with an annual pass. For more information, call 604-513-4777. Canada’s national parks and national historic sites enable Canadians to experience their rich history and heritage in a special way and will play a big part in the celebration of Canada’s 150th anniversary. 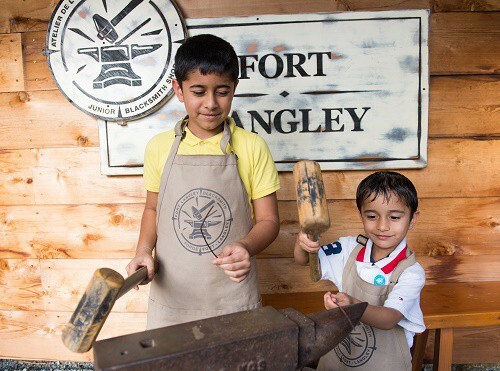 On July 1, Fort Langley will celebrate Canada’s 149th Birthday at the site where British Columbia was born. Visitors can enjoy multicultural music, cake and a ceremony at noon, and family activities. Families can join the Parka scavenger hunt and enter to win the Parka prize package.